The past few weeks have pretty pretty intense with traveling. A nice holiday in Tunisia was followed directly by JavaOne and JDD Krakow which was last week. Although JavaOne is a few weeks back already, I’m still processing it and most of this post will be reflections on the conference. Aerosmith was playing at JavaOne and although they are all about 300 years old, they still bring an enormous amount of energy on the stage. This also brings us to the music choice of this week. JavaOne was a very interesting week as always. The interesting bits definitely did not come from Oracle’s keynotes however. Although keynotes are hardly ever the most interesting part of a conference, they did reach an all time low this year. One important reason for this is that there is simply not much news to tell. Java 8 is great, but old news, and plans for Java 9 are still mostly vague. Java EE is moving forward slowly, but isn’t that interesting in a time where we’re thinking cloud instead of app server. Does that mean our beloved Java ecosystem is slowing down? Not at all! A lot is happening in the cloud. The most interesting movement is that the boundaries between Infrastructure as a Service and Platform as a Service are blurring. Google, RedHat, Microsoft and (in somewhat lesser extend) Amazon are all working to make deployments of your own stack easier. In the past, using a PaaS like AppEngine or OpenShift meant running with lots of restrictions. On the other side, running your own stack implied bringing your own OS and auto scaling setup. Although you can definitely successfully deploy on a IaaS, proven by Netflix and PulseOn (ok, PulseOn still has a slightly smaller deployment footprint) you do need a lot of knowledge to make this work. As I said, this is changing. The cloud vendors are not just all working on it, but to some extend, they are working together on making this possible. Docker is an import technology in this trend. Soon it will be possible to deploy light weight containers directly in the cloud. This again does change the way we can think about deployments, containers and servers. It’s also interesting to see Microsoft playing a major role in this, with support for Docker/CoreOS on Azure and joining the Kubernetis project. Another trend going for a while already is using more and more functional programming. This is now even more relevant with Java 8 Lambdas available. The following JavaOne recording is a good way to learn more about functional programming. Next, there is the theme of IoT. Slowly we’re seeing more than just playing with Raspberry Pi’s. Something that didn’t make the big spotlights yet, but that does seem to be happening is that Oracle is partnering with ProSyst to create a IoT platform based on OSGi. Provisioning is part of the story, using a closed source system. This is going to be a very relevant area for Apache ACE. Much more fun than all those small devices by the way is this: An Audi RS7 racing Hockenheim on auto pilot. Cool. Related to the new ways we can deploy application the idea of Micro Services is getting a lot of attention. 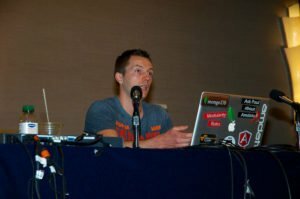 This was a hugely popular topic at JavaOne, although it seems most people are just following the hype without having any clue what it is about. Part of the Micro Services story is of course modularity. Our Amdatu stack is a really nice way to work with a modular approach from the start, while gradually moving services to different systems when necessary. Watch the JavaOne channel on Parleys to see more talks being published, including Marcel’s talk about exactly this topic. Finally some none tech related topic: Food. For a while now I have been very interested in healthier eating in relation to athletic performance (which is huge). With that I’ve also found some really interesting videos about the other end of the spectrum; the food industry in the US and by extension, our own food industry. The first video is called ‘Fed up’. It shows the huge problem of bad eating habits, such as the fact that by 2020 the majority of Americans will have diabetes. Another great video is a TED talk from Jamie Oliver (that’s right, the chef), who discusses this problem. We’re still doing a lot better than the US, but we’re not that far of. The solution to this problem starts with education, which probably makes us all responsible for improving this situation. Oh, and before you get to work, make sure to tweet about the OSGi/Amdatu event we’ll be hosting in Bucharest in November.